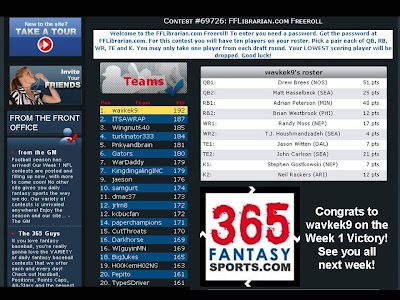 And the winner of this week's FFLibrarian weekly contest with 365FantasySports.com is: wavkek9. You can see wavkek9's lineup and the other leaders in the graphic below. If you missed the chance to participate last week, no problem. The beauty of this weekly league is that you can jump in or out of each week's competition. If you'd like to participate this week, the password is 2book. You'll need to register to play if you haven't already - and then just look in the contest lobby for the FFLibrarian.com Freeroll game. We had 55 participants last week and I'd love to see even more of you participate this week!